Barrett wins 46 – 39 in a two-frame roll-off. 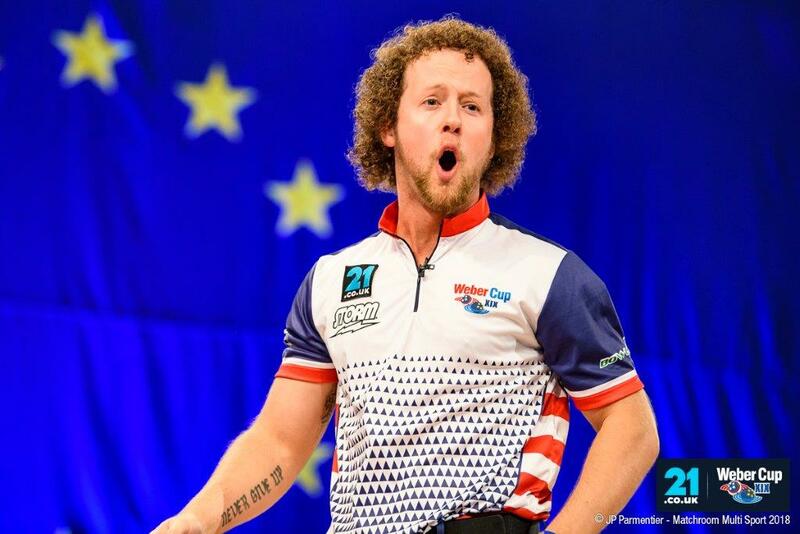 IT WAS another session win for the USA as they took it 4-3 to increase their lead to seven points and leave them leaving needing just five points to win the 21.co.uk WEBER CUP for the first time since 2012. However, there was some small glimmer of hope for the Europeans as they won three of the last four matches. Dominic Barrett put in a captain’s performance as he won the final two singles matches; first beating Chris Barnes with the tournament’s highest score to date, and then beating Anthony Simonsen in the second roll-off of the day, after nominating himself as the captain’s pick. The USA had started where they left out at the beginning of the session as they took the Baker match and then Chris Barnes got the better if Barrett in a clash of the captains. Simonsen who is playing superbly in his Weber debut got past Stu Williams to keep his unbeaten run intact. That took the overall score to 12-4. Jesper Svensson stemmed the flow in the fourth game as he took care of an out-of-sorts Tommy Jones but the stellar Kyle Troup redressed the imbalance with a win over Martin Larsen. That took the score to 14-5 for the USA before Barrett pegged it back in the final two matches. Barnes summed up the day for Team USA; “We are extremely happy with today. We got off to a good start but we knew they would come back. We were able to come out in the second session, we really started off well and got the 3-0 lead for the session. Our goal was to win every session and then the overall goal takes care of itself. “I probably didn’t do a great job picking the pattern there, Tommy didn’t particularly care for that one and Kyle struggled a little bit although he did get a win. Barrett took the positives from the evening’s show; “It didn’t matter who stepped on that stage from our team we needed that, so I am glad to be the one to do it and not let this get away from us. We’ll go away, have a good night’s sleep tonight and turn up fresh tomorrow, use what we have just done as a team to look forward. Play continues at 12.30 on Sunday with three doubles matches and four singles matches.